25 Ft Clear Globe G40 String Lights Set with 25 G40 Bulbs Included End-to-end - UL Listed Indoor & Outdoor Lights Settings Patio String Lights & Christmas Decorative Lights & Holiday Lights & Umbrella Lights Perfect for Backyards, Gazebos, Gardens, Pergolas, Decks, City Rooftops, Weddings, Garden, Bbq, Dinner Parties, Birthday Parties, Gatherings Commercial Quality String Light Fixture for Indoor / Outdoor Use With Updated Energy-efficient Bulbs Bulb Count: 25 Bulb Spacing: 12 in. Diameter of Bulb: 1.5 in. Bulb & Socket Type: G40 w/ a C7 / E12 base Lighted Length: 24 ft Total Length (end to end): 25 ft Length of segment from plug to 1st bulb: 1/2 ft (6 in.) UL Listed for Indoor & Outdoor Use. 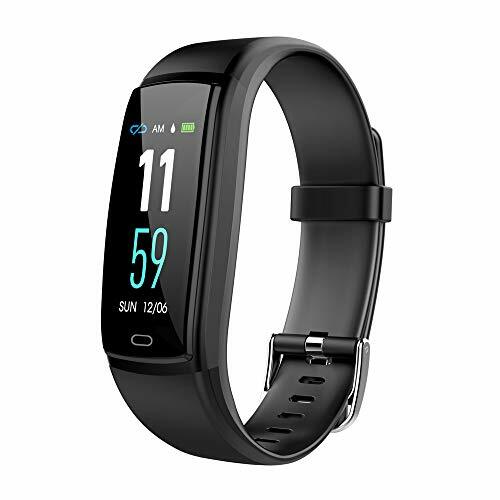 Connect up to max. of 3 strands Globe G40 String Lights is perfect for any special occasion, adding a warm and charming festive accent to your gatherings. Brightown offer one-year quality guarantee for all products. 25 feet long string with 25 clear G40 Bulbs, end to end connectable. Light bulbs have candelabra (E12) socket base, UL listed. Brightech's Ambience Pro Outdoor Lights feature WeatherTite technology, which means we built the wire with extra protection levels. We also wrapped it in a strong rubber casing of premium quality construction, so our strands will hold up to the harshest weather conditions. WeatherTite makes our product last much longer compared to lesser quality lights available. Our light strands are well insulated so you can leave them outside all year long, even during bitter cold winters. Rain will fall and wind will blow, yet these heavy-duty weatherproof light sockets are strong enough to withstand the wear and tear of outdoor use year after year. The included 11 watt bulbs (165 watts total) are bright enough to enjoy an outdoor meal. Satisfied customers say the gently swaying bulbs look reminiscent of falling stars. Tether up to 8 strands together with nothing needed to connect additional sets. Lights can be attached to a dimmer switch for greater lighting effect versatility. Recommended for use in arbors or other open air spaces for festive occasions, garden parties, weddings, winter holiday & Christmas events, indoor use, or city rooftops. Don't Staple Your Shirt To The House Like Clark Griswold! The length of our cord (choose 24 foot or 48 foot) lets you arrange strands in a variety of patterns or clusters via zip ties. For installation, we recommend a 16-gauge guide-wire and then affixing the lights every 3 or 4 to the guide-wire, or anchor the heavy-duty strand with cup hooks into material that can support the weight. To stage a canopy, we strongly suggest you suspend strands from tensioned and anchored wires while spreading the load across truss wires. Not recommended for a trellis or for combining with paper lanterns. Power the lights via 110v plug-in outlets, not designed for 220v outlet use. PATIO LIGHTS TRANSFORM YOUR EXTERIOR INTO A CLASSIC CAFE: The Ambience Pro lights for your pergola, porch or other outside space create a great atmosphere where you can sit back, relax, and enjoy the evening. These vintage Edison string lights with exposed filaments give off a warm, nostalgic glow so that you can come home after a busy day and enjoy your very own retreat. STRING UP A CANOPY OF EDISON STRAND LIGHTS FOR WEDDINGS, PARTIES ETC. : Create a warm garden atmosphere with these retro filament Edison bulbs. 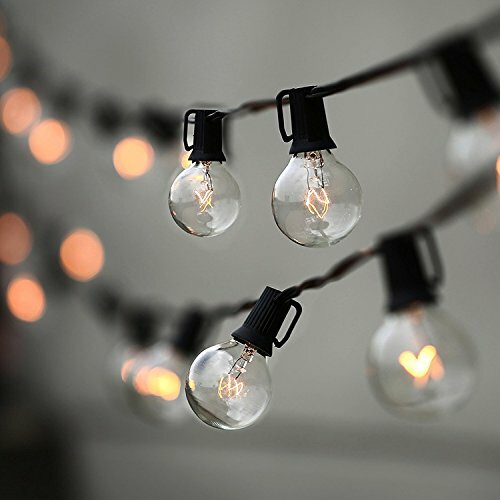 Add a festoon touch to a wedding reception, cocktail party, birthday, BBQ, carnival etc. Each 48 foot strand contains 15 hanging 11 Watt bulbs spaced 3 feet apart. Connect up to 8 strands end to end. HEAVY DUTY, COMMERCIAL GRADE WEATHERPROOF LIGHTS: These yard lights are durable thanks to Brightech's industrial grade WeatherTite Technology. These lights are waterproof and have withstood Nor'Easters blowing at 50 MPH, per reviews! They are UL listed, and the extra thick light cord is flexible. Confidently leave these string lights on display year round. BEST DIMMABLE ELECTRIC PLUG IN LIGHTS SET THE RIGHT MOOD INDOOR OR OUT: For mood lighting on the balcony or in the bedroom, wire the rope to a dimmer switch. Ideal for a romantic dinner for two, an elegant nighttime celebration, or a wedding reception. Use indoors or out, the choice is yours. SATISFACTION GUARANTEED WARRANTY: Our goal at Brightech is to provide creative, innovative, and beautiful lighting so that everyone can have quality, high end lighting in their home. We proudly stand behind all of our products 100%, which is why we offer a full 3 year warranty on the strand and a full 3 month warranty on the bulbs. If for any reason you are not satisfied with your purchase, please contact us because our number one goal is customer satisfaction. Stylishly illumine your after-dark outdoor dining - while saving on your power bill - with Brightech's Solar Ambience LED S14 String Lights. These tech-savvy light sets (12 bulbs per strand) mimic the classic look of flickering, exposed filament bulbs without any of the high cost associated with incandescent lighting. The LED bulbs look warm yet stay cool. They never generate heat. Best of all, they last around 20,000 hours, and they imbue a soft, nostalgic glow to campers and backyard gardens alike. The LEDs in this 26-foot strand use only 1 Watt per bulb, for a total of 12 watts per set. We make our bulbs out of durable plastic shells. They will not shatter like ordinary glass bulbs, and can be displayed with complete confidence that they won't break. The bulbs measure 2 inches in diameter. A generous 20 inches of space in between bulbs gives you room to decorate on a garden roof, across a gazebo, or in an open-air bistro. The total length of the strand is approximately 26 feet across, 18 feet for the spread of the bulbs, and 8 feet for the cord extending to the solar panel. Color temperature of 3,000 Kelvin provides soft, pleasant mood lighting that's just right for a romantic dinner al fresco. ITALIAN STYLE BISTRO LIGHTS TRANSFORM YOUR YARD INTO AN OUTSIDE RETREAT: Brightech's solar powered pergola lights create ambience so you can sit back and enjoy the eve. Bright enough to grill and eat by, without being overpowering, these lights give off a warm, nostalgic glow so that you can come home after a busy day and enjoy your very own retreat. LED SOLAR MARKET LIGHTING FOR YOUR EXTERIOR SPACE; CLIP OR STAKE PANEL INSTALL: These LED deck string lights use solar power so you don't need an outdoor outlet and you save money on electricity! Install by attaching with a clip (e.g. to pergola roof) or a stake in the ground. They put out 3,000K warm white light and the life is up to 20,000 hours. A full charges takes 6 hours of sunlight, and suffices for 5-6 hours; bulbs stay cool, always. COMMERCIAL GRADE WEATHERPROOF GAZEBO LIGHTS FOR YOUR BALCONY / GARDEN: Built With Brightech's durable WeatherTite Technology so as to withstand extreme temperatures, rain, wind, and damp climates. Customer reviews say they've withstood winds up to 50MPH and lots of rain. These bulbs are made out of strong plastic shells to avoid breakage. Install once - easily - and leave up year round. BEST RETRO EDISON BULB STRAND LIGHTS FOR WEDDINGS, BIRTHDAYS & PARTIES: Install as a scalloped carnival canopy over your terrace to set the mood for an elegant reception or a friendly BBQ. 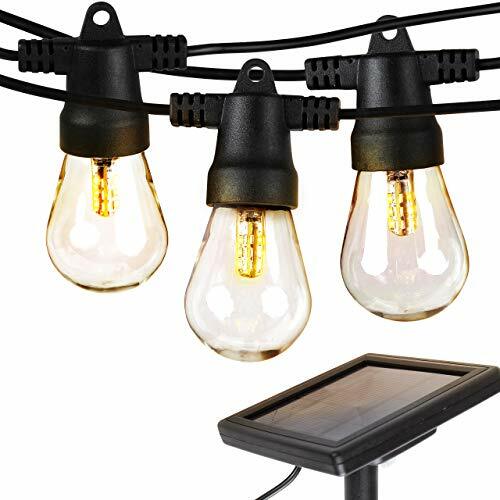 These Solar Powered heavy duty LED string lights will create the perfect atmosphere for a . Each strand is 27 feet long with 12 S14 bulbs spaced 20 inches apart (the lighted portion is 20 feet). There are 6 feet between the solar panel and the first bulb. Our photo clip string lights display gives the best atmosphere for your events, room decor and more. What better way to show off your special photos to guests! LED photo slip string lights, a perfect d cor to create or remember memories at your home, party, wedding, or some official events. Hang them anywhere with nails, tape or simply drape them! 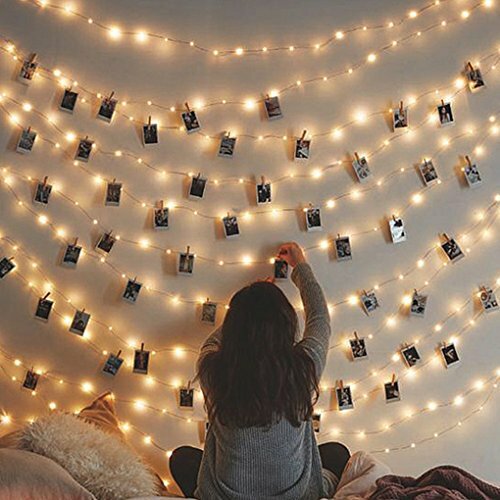 String lights with photo clips for bedrooms, not only hang photos, but also hang your art works, memos or any other small things you want to cherish. A special way to show your memories! It's not only a wall hanging decor, also an ideal photo showcase. It's an ornament; also it can be used as a gift for your family or friends. Hanging clip string lights, can decorate your garden, home, living room, bedroom to add a beautiful glow to your life. Length: 20 LED - 7.2 feet/2.2m; 30 LED -10.5 feet/3.2m; 40 LED- 13.7 feet/4.2m; 50 LED - 17.1 feet/5.2m. Led photo clip string lights are used for indoor/outdoor use, but not waterproof. DO NOT stare at the light bulb directly as this may damage your eyes. Reply within 24 hours. Feel free to contact us! No questions asked! Now, it is time to get the attention of your guests! Add this to your cart today! DORM LIGHTS FOR ROMANCE : Each clip contains an LED light that emits warm white light. These dorm lights can hang photos, memos and other small stuffs worth remembering. When turning on the lights on the night, the items can create romantic atmosphere, spreading warm lights. It is indispensable for festival decoration across a wide area, fun and unique way to liven up your home, office or dorm room. WARM DISPLAY DECORATIONS ACROSS A WIDE AREA : Clip string lights, can be put or hung on walls, windows, doors, floors, ceilings, grasses, or Christmas trees etc. These string lights can decorate your garden, home, living room, bedroom to add a beautiful glow to your life. In addition to home decoration, string lights can be used in some special occasions like Valentine's Day, Christmas, other holidays, party, and weddings to create a warm romantic atmosphere. CLIPS HANG ON YOUR PRECIOUS MEMORIES : The fairy clip string lights, apart from hanging photos, you can also hang your art works, memos or any other small things you want to cherish. This special commemorative way shows to people how they love and how they treat this beautiful memories directly, more cozy and warm. BATTERY OPERATED 20 LED STRING LIGHTS : Please recognize 'Besteamer' store. 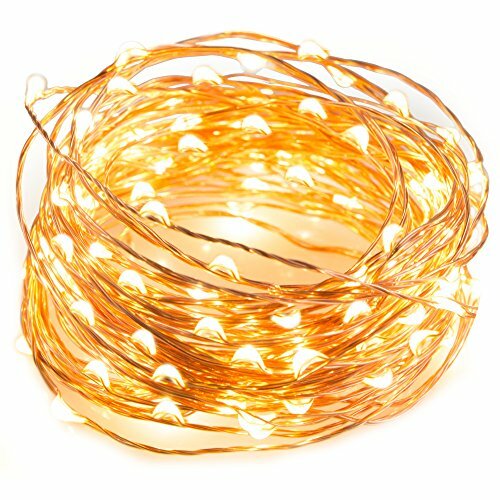 Other clip string lights quality offered by fake sellers cannot be guaranteed. Please customers note!! 20 LED Photo Clip string lights, powered by high-performance AA batteries, are energy-saving and eco-friendly. (AA batteries not included), easy to install and safe for children, convenient to prepare indoor/outdoor decor. No need to worry about your display being near an outlet or power source. 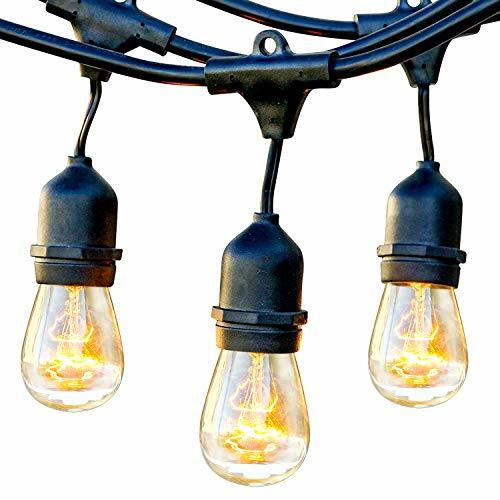 PHOTO CLIP STRING LIGHTS SPECIFICATIONS : 20 LED CLIP STRING LIGHTS-length of wire is 7.2feet/2.2m; 30 LED CLIP STRING LIGHTS-length of wire is 10.5feet/3.2m; 40 LED CLIP STRING LIGHTS-length of wire is 13.7feet/4.2m; 50 LED CLIP STRING LIGHTS-length of wire is 17.1feet/5.2m. These lengths are long enough for you to hang many photos, art works and memos. If your things are much more, we advise you to purchase more sets. More string lights can create more warm and romantic atmosphere. Yes! Adapter output is 4.5V, which is absolutely safe to touch (Critical harmless voltage for human body is 24V); LED emits low heat and is free of fire hazards, it s safe to hang on curtains, woods or any trees. Yes. The light string is waterproof (however adapter and connection aren t) with working temperature of -4 F~140 F, so you can use it outdoors in snow, rain or direct sunshine. 2. The lights couldn t be extended or connected with another string. Cost effective and energy efficient. 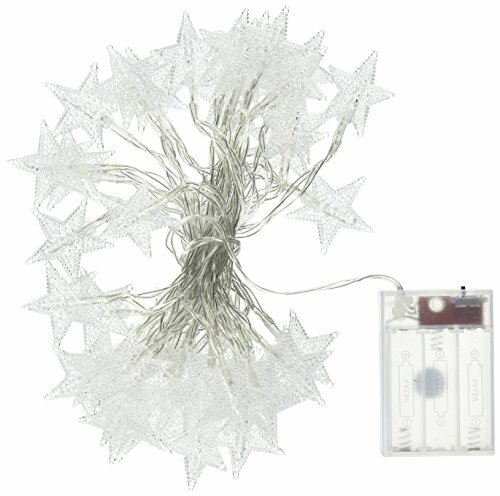 The LED String Starry Light will not overheat after many hours of usage. You can safely touch it even after 14 hours of usage. Please kindly note that the string light could not be extended or connected together. It's not fully waterproof, please be careful when use in outdoors. Brightech Ambience Pros feature WeatherTite technology, which means we've built the wire with extra waterproof protection against nature. Wrapped in a strong rubber casing of premium quality construction, our strands will hold up to the harshest elements. They are well insulated so you can leave them out all year long, even during bitter cold winters. Rains will fall and winds will blow, yet these heavy-duty outdoor LED light sockets are strong enough to withstand the wear and tear of outdoor use every year. Conserve energy with these 2-watt LED bulbs (15 in all) made of durable glass to lend a classy restaurant look and feel. (For replacement bulbs search for B01IQIUYU8) The vintage design with charmingly retro exposed filaments provides light bright enough to enjoy al fresco dining after dark, but at 3,000k they're still very gentle on the eyes and environment. Tether up to 40 strands together with nothing else needed to connect additional sets as they plug into one another, end to end. Lights may be attached to a dimmer for greater versatility in mood lighting. We recommend using the Lutron Dimmer, search for B004DZONXI. Make sure the whole neighborhood knows wherever you are, is the place to be! The 24 foot length of our cord lets you arrange strands in a variety of patterns or clusters easily thanks to the hanging loops along the light strands. Attach the loops simply by using zip ties, cup hooks, or guide wire before enjoying a night under the stars. Recommended for use in arbors, your porch, or other open air spaces for festive occasions, garden parties, weddings, winter holiday & Christmas events, indoor use, city rooftops, or simply for energy saving ambience year-round. 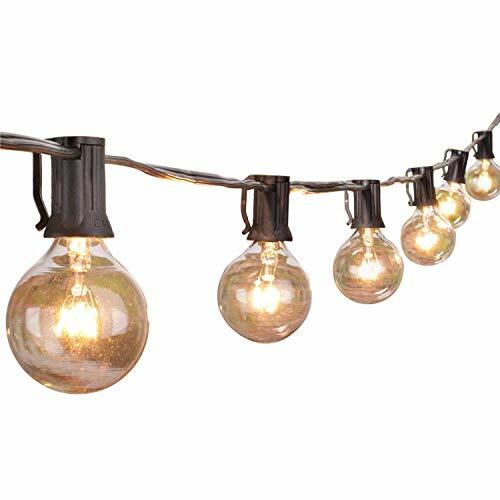 Reminiscent of carnival or romantic bistro lighting, LED Outdoor String Lights by Brightech make every night feel like a timeless celebration! 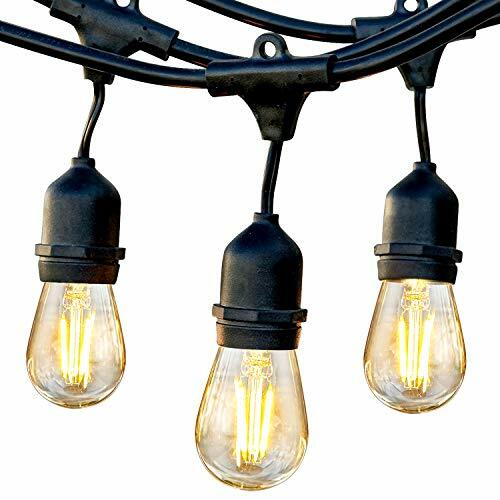 DECORATIVE RETRO EDISON FILAMENTS CREATE GREAT AMBIENCE: Use dimmable, pergola canopy lights for your wedding reception, birthday party, or other event. These Edison strings with exposed filaments give off a warm glow reminiscent of old world bistros. Increasingly popular as indoor lighting too, for bedrooms, bars and restaurants. Dimming requires LED-compatible dimmer. HEAVY DUTY, COMMERCIAL GRADE WEATHERPROOF STRAND LIGHTS FOR YOUR EXTERIOR: Industrial grade WeatherTite Technology by Brightech makes Ambience Pros durable. These lights are waterproof and have withstood winds blowing at 50 MPH, per reviews! UL listed, and the rubberized, flexible cord is thicker than a traditional rope. Confidently leave these lights on display year round.